HARRY AND HORSIE by Katie Van Camp may end up being very well-worn by the end of this school year. I saw it on the shelf at Cover to Cover this week and was immediately drawn to it. The cover art and all of the art is amazing--it resembles old comic books/cartoons. You can tell from the cover that this will be a fun adventure story. This is the story of Harry and Horsie. They sneak out of bed to play with Harry's "Super Duper Bubble Blooper" . They have great adventures until a giant bubble takes Horsie away. Luckily, Harry comes to the rescue for a happy ending! This is a great story that anyone who loves to imagine and play will love! This is the author's first book and the illustrator's (Lincoln Agnew) first picture book. I don't know if it is eligible but it certainly looks like Caldecott material to me. It is currently on the Autumn 2009 Kids' Indie Next List. And the author/illustrator team are donating a portion of the proceeds to "Free the Children"
The round up this week is at Book Aunt. If you want to host the round up in the future, let Kelly know at Big A little a.
I received a KINDLE as a gift several months ago. Over the summer, I have done more reading on my Kindle and less with "real" books. I have been thinking a lot about it--lots of people have been asking me which I prefer, etc. So, I thought I'd share my reflections. There are times I LOVE my Kindle. I started out reading only nonfiction, starting with THE ELEMENT by Ken Robinson. I thought it would be hard to get into a novel. But then I read THE BRIEF WONDROUS LIFE OF OSCAR WAO and loved it. Once you get started, falling into a book is the same whether you are reading a "real" book or a book on the Kindle. I think the highlighting and note taking features are the best thing. I am not sure what the possibilities are with these tools but these are actually the tools that sold me on the KINDLE. When I am reading a book, I can underline and take notes (right on the spot where the notes belong!) Then when I go to my clipping area, all of my notes for each book are compiled. I think the implications for book talks and book study are huge with this. For me, this feature made the KINDLE a different kind of reading for me. Knowing I could highlight and take notes and have those all in one spot, rather than flipping through the book and finding them all, is huge. I think this could really impact student and adult book talks--really allowing us to create new thinking off of a book and sharing it in ways that we really couldn't before. I can read a sample of almost any Kindle book available for Free. Whenever I hear of a good title, I often order the free sample and read it--often about a first chapter. They send you a lot of text to preview. And then if you like it, you can order the book. It is sooo easy to carry. That is obvious. But the fact that I can go somewhere and THEN decide if I want to read a novel, something professional, etc. is great. I have all of my reading with me. And if I don't, I can get it pretty quickly. I can order a book and have it in 30 seconds. I didn't think I would care, but I recently read a sample chapter of THE SLIPPERY YEAR (a great read for anyone in their 40s:-) and loved the sample. I was laying in bed reading one night and decided I wanted to read that book. Even though it was midnight, I could order the book and have it in about 15 seconds. I didn't have to find time to get to the store, etc. I can email myself PDF files and read those on my Kindle. I wasn't sure I would use this feature, but it has been great. First of all, I don't need printouts of Ali of the things I often print to read. By sending it to my Kindle, it doesn't become part of some huge pile. Instead it just becomes an option for my reading and it is much easier to read than reading it off of the computer. I can't loan my books out. 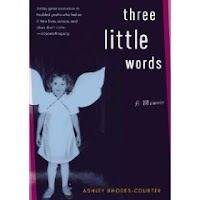 When I decided to read THREE LITTLE WORDS, I knew I might want to pass it along. So, I purchased a real copy. It is a little frustrating to tell someone about a great book but not be able to share it with them. And I sometimes, when I find a book I love, I have the urge to carry it around and tell anyone about it who will listen. A Kindle makes this a bit difficult. It takes a bit of time to get used to the idea of no page numbers. Instead of page numbers the Kindle tells gives you numbers and percentages to let you know how far along you are. For me, I need to know how long a book is and how many "pages" I read each sitting. To combat this, I often look up the page count, then figure out what 10% is, and go from there. There are not "real" covers on the Kindle. It is a bit odd to walk into a bookstore and see a book you just read but not recognize it. To pick a book up to read every day and not see a cover. For me, covers and previewing are important. Covers tell something big, give us a clue into the theme. I miss that. I also haven't noticed many of the things I often find on the back cover. I miss that. I LOVE bookstores. Love to shop, carry books, buy books. I have even been known to buy books that I already have because I love them so much. I am worried about bookstores with the increased popularity of the Kindle and other readers. I am having trouble not shopping for books, real books,in real bookstores, with real people. I am not sure anything can replace that experience. I have a shelf of books that I have read but can't part with. Books that I LOVE. Books that I hope someone sees on the shelf and wants to read. Books I hope my daughters read when they are older. Books that have changed me. I can't really have that physical shelf on a Kindle. Overall, I LOVE the Kindle. The more time I spend reading Kindle books, the less I find myself needing paper books. I remember a similar experience when I gave up the yellow legal pads for writing and moved to the computer. I wasn't sure I'd ever be able to give up the "real" paper. Now, that seems long ago and amusing. Composing on paper almost never happens for me. And as a teacher, I think it has huge implications for our classrooms. When I think of the amazing book talks my 4th and 5th graders have had--studying a title, sharing notes, etc. I can see this as a way to add even more depth. The notes feature alone can be pretty interesting. There is also a great SEARCH feature. I remember one group that studied the way that the word "soof" was used in SO BE IT. A Kindle would allow them to search all of the places in the book that the author used that word. Can you imagine the conversations? Being able to search a word in fiction in order to think about theme, find evidence for thinking and working through clues can really add to deeper reading. I can only imagine what is possible. I am pretty sure that soon, the Kindle will be my entire reading life. It will be good because I will have SOOO much extra room in my house. I can see myself falling more and more in love with it and relying on it more and more. It took me less than 5 minutes, I told her. All I had to do was meet my class. Teachers are jugglers. The balls and plates and swords and bowling balls and pins are in the air from the very first moment the children step into your line and become your class. We simply cannot afford to "get into the swing of things" later on in the week or the year. It's such a blessing to be doing the work I was born to do. Let the fun begin! This is a GORGEOUS book. You can go on a fall nature walk without leaving the comfort of your home or classroom when you read this book. Along with the trees, each picture contains animals, birds, and insects that live in the Eastern Woodlands. In the back matter of the book is more information about the trees and the ways that people and animals use them. Check out this link on the Sylvan Dell website for teaching activities, a book trailer, and an interview with the author. This book is a counting, rhyming, month-by-month wolf book. In January there is a lone wolf howling at the moon. After pups are born, there are six wolves in June, and by December, there are twelve wolves singing together in the winter night. The back matter of this book gives readers more information and activities that will extend their learning about wolves, and again, the Sylvan Dell website has still more goodies to go with the book. Both books invite readers to both browse and read with the fun mix of genres and the beautiful illustrations. Time to learn and time to play!" When Mama Llama leaves Llama Llama on his very first day of school, he is suddenly very shy and doesn't want to play, or read, or even eat a snack. The promise by the teacher that Mama WILL come back, and the invitations of the other Llama children to come play are all it takes to break him out of his shell. Mama does indeed come back and Llama Llama realizes he loves Mama AND school. This is a great book for any reader who might be feeling a little anxious about the first day of school! 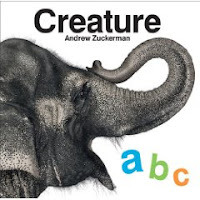 Beth at Cover to Cover had CREATURE ABC by Andrew Zuckerman waiting for me when I visited last week. And I am so glad that she did. This is a gorgeous animal alphabet book done in photos. It is very simple in concept--a letter, an animal and the animal word for each letter of the alphabet. This book is a chunky square book. The photography is stunning and is placed against a white background. Kids are going to love it! Each letter is introduced with a photo of an animal. Then upon turning the page, the animal name is revealed (although not really as a surprise), with another picture of the animal/letter word. Most of the letters are represented by animals but some like N is represented with the word "Nocturnal" with a few examples of those. A simple concept that I think kids will spend hours with. Really unbelievable pictures. (In case you are wondering, the rooster is my favorite.) It is a great book for young children or children just learning animal names. I am pretty sure that it will also be popular with older kids in the library. I also picked up THE ZOO I DREW by Todd Doodler last week. It is a great book that I am excited about. The cover is unique--red and corrugated. Very bright and engaging. This is an alphabet book of animals. On each page, there is an animal-the drawing takes up most of the page. And the pattern is predictable "E is for Elephant". Following each animal name, there are 4 lines about the animal. The lines are mostly in rhyme and they give some basic information about the animal. For example, we learn that the panda eats bamboo and the rhino has a horn on its nose. I love this book--can see lots of possibilities--a great one to use as an ABC book with kids just learning letters/sounds, etc. It is also a great model for writing for older kids who are beginning to write nonfiction. I can see it used in lots of ways. Kids love flags and maps and all things related. 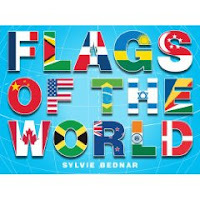 That is why I think they will love this new book by Sylvie Bednar--FLAGS OF THE WORLD. The introduction to the book says, "A flag can tell you a lot about it country. Flags represent the history, legends and beliefs, and sometimes even the geographic location of a country!" The flags are displayed and organized by continent. Each is against a white background. For each flat, there is some information about the flag--what it tells you about the country. This book is just packed with visuals of flags and information about each. Not lots of information--just enough that kids can read the entire blurb about a flag. I think it will be hugely popular in the library. SHARE YOUR READING STORY ON OUR GALLERY! Members of the Kidlitosphere are invited to submit stories from their reading lives. Your submission can be an anecdote from childhood, a recent experience around books or reading, a memory from school (good or bad), a vignette about learning to read, the impact of a particular book--anything about your life as a reader. 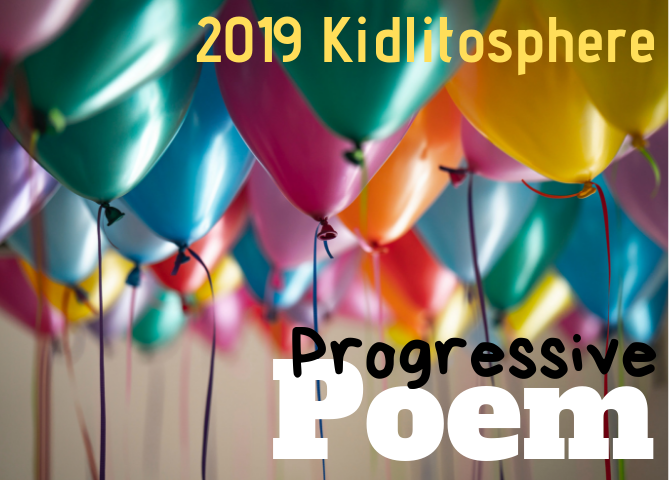 We are looking for a variety of short pieces (think blog post length) from anyone in the Kidlitosphere, including bloggers, authors, illustrators, readers of blogs, etc. Our gallery is open to everyone who is a blogger, blog reader, author, illustrator, blog reader, blog commenter, etc. Here's information about submitting your piece of writing. The Poetry Friday Round Up is at The Boy Reader this week. We are excited to be hosting a Local Gallery as part of NCTE's NATIONAL DAY ON WRITING CELEBRATION! On October 20, the National Galleries will be open to the public. There are lots of great galleries that highlight the writing that we all do in our daily lives. Mary Lee and I will be curating a local gallery as part of the submission and we are inviting you to join us by writing a piece for the gallery. We wanted the Kidlitosphere to be part of the National Day on Writing so we started a gallery that went along with the thing we do best--write about our reading lives. Everyone who is a blogger, blog reader, author, illustrator, blog reader, blog commenter, etc. is invited to submit a piece of writing. We hope you'll join us! You can visit our local gallery, "A Lifetime of Reading" to submit a piece and read about guidelines for submission. Right now, it is empty, but we are excited about the possibilities--a place to share stories of our reading lives! We think the Kidlitosphere can pull together to create a pretty amazing gallery that celebrates the lives of readers! This is stop-action animation, NOT a video project. We shot about 100 still photos to make this movie! 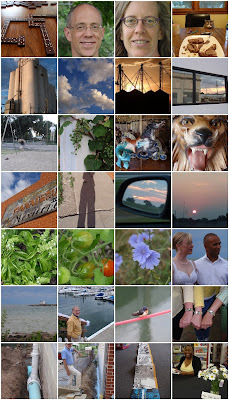 The next time I do a stop-action video, I will make sure we shoot at least twice as many photos. I can't wait to show this to my students and to give them a chance to try it, too -- it's quite fun!! 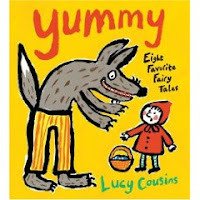 I love Lucy Cousins and was thrilled to see her new fairy tale collection, YUMMY: EIGHT FAVORITE FAIRY TALES. Cousins has retold 8 fairy tales in this collection--Little Red Riding Hood, The Three Billy Goats Gruff, The Enormous Turnip, Henny Penny, Goldilocks and the Three Bears, The LIttle Red Hen, The Three Little Pigs, and The Musicians of Bremen. There is soooo much to love about this book. *This is a slightly oversized book--quite a fun size that kids will love to carry around. *Cousins' brightly-colored illustrations make for very fun versions of the fairy tales. The size and colors make this an inviting book for read aloud. Somehow Cousins' illustrations make the stories a little less scary. The characters have smiles and rosey cheeks. They are quite lovable. Even when the wolf eats Granny, the illustrations make it a bit less scary. *The text is supportive. I am thinking of those readers who are dying to read chapter books. (As you know i think society pushes them to chapter books far too soon...)This book "feels" like a chapter book--but is far more appropriate for younger readers. The text is spaced well with great line breaks. The text is not overwhelming on the page--it is a good amount for kids ready for a longer-type picture book. *Cousins has fun with font for sound effects, titles and more. 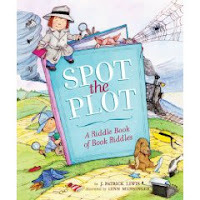 SPOT THE PLOT: A RIDDLE BOOK OF BOOK RIDDLES is (in my opinion) a must have for all classrooms and libraries. It is brilliant and fun. I have a huge collection of books about books and books about reading so I was thrilled to see this new book by J. Patrick Lewis. But this one is now one of my very favorite books of 2009! It is quite the treat of a read. Really, this book is too fun. I smiled every time I solved one of the riddles. It was a fun read, figuring out the books in the riddles. But I see this book as one you can visit again and again. My first job as a reader was to solve the riddles, but now that I've done that, I can read it again to see the brilliance in the writing, the thoughtfulness in the word choice. What a fun model for our students! I can see kids going back to this again and again and again. I took one look at my to-be-read-before-school-starts (kids start in just over a week -- eep!) pile and I think there's no point in denying it: I am a series junkie. Thea Stilton is Geronimo's sister. In this sub-series, she is all grown up and back at her alma mater, Mouseford Academy, teaching journalism. Five of her students make up a mystery-solving, adventure-loving group called The Thea Sisters. In this book, they solve the mystery of a disappearing classmate. The Bone books are enormously popular in my classroom, and because of that, I see it as my obligation to stay current with the series. (or, alternatively, "I am a series junkie.") The first month or two of school, lots of my readers immerse themselves in graphic novels. Some may be "picture reading," but as long as we can talk about the basic plot and the characters, that's okay with me. After these reluctant text-readers have lived in my classroom for a month or two, they've had a chance to see that all kinds of reading is valued there: easy, challenging, graphic novel, wordless, picture book, poetry, and on and on. Back in January of 2008, when I discovered the first volume of this series, I declared it "Required Reading." Recently, I spotted volumes 2-4 on a bookstore shelf, but our public library only has volume 2. I'll be putting in a request that the other volumes be purchased. These 500+ traditional manga (reads right to left) graphic novels give the reader a glimpse into the struggles and joys of a family learning to understand their autistic child, Hikaru. The first volume was birth through early elementary years. Volume 2 is "Later Elementary Years." So there you have it. Proof positive that I am a series junkie. Excuse me now. I need to dig in and get caught up with my stories! Best wishes for a fabulous school year! Tell me that you're happy I am here. See my right, and I will work on the "wrongs"
The round up this week is at a wrung sponge. In the spirit of full disclosure, I must reveal that I did not create the TextFlow of the Emily Dickinson poem that I shared last week for Poetry Friday. I found it, right there with her poem, on the Poets.org site. Look here for all of the poems on their site that are animated with TextFlow. And yes, if you are so inclined, you will someday be able to try it for yourself. Our district sponsors a great 2 day institute for teachers, the Dublin Leadership Academy. It is one that is run by teaches and is a great way to move from summer mode to school mode. This year's Leadership Academy was held last week and over 400 district teachers attended. I loved getting together with colleagues talking through our visions for the year. (The 2 days is set up with keynotes, small sessions, time to work with building colleagues, and time to work with others in the district who have similar roles-a great balance!). 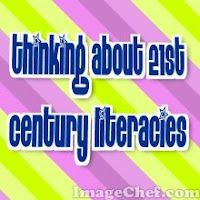 One of my roles was to do a 55 minute session on 21st Century Literacies. I have been thinking about this and sharing my work over the summer so I had a PowerPoint Presentation created on the topic. But I kept hearing about Prezi, had seen it used, had played with it for a few minutes and was intrigued by the idea. So, I thought I'd give it a try. On the Monday before the academy, 8 days before my presentation, I made a decision to use Prezi instead of PowerPoint for the next week. I thought I'd share some things I learned that might shed some light on how to make this all work in the classroom. For those people who know me well, you will all agree that I am not a linear person. My thinking follows its own pattern that only my good friends seem to understand. So, for the last few years, as I've been using PowerPoint for presentations, it has been a bit of a struggle. I loved the product, but in the midst of a presentation, I might decide to go a different direction based on feedback from the group and I had trouble doing that. When I saw Prezi, it seemed to be the answer for me. In the time of overheads and transparencies, my workshop planning looked like this: spread everything over the entire kitchen table and organize it into little piles of pieces that work together to tell a story. 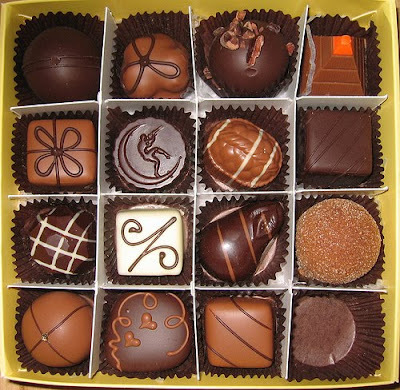 Then I would figure out how those pieces went together and organize it in that way. I am pretty sure that the Prezi developer worked in the same way. Find "piles" of information that go together and pull them together in a way that works. No template, no parameters, just a blank table for your thinking. I have to say that I loved the process immediately. I think from an audience perspective, the presentation is similar. You see slides go up and change and you follow along. But for me, the power was in the way I thought through my talk--how I was going to organize it. The tool forced me to think about what I wanted to say in a different way--the visual component had to be first where that wasn't the case with other programs. I had to think through big pieces first rather than the order I would move. And I also had to think about how the whole thing went together.The concept worked for me. I was also able to teach myself (give or take a few phone calls and frantic emails to friends who were more proficient with Prezi..). But I was amazed that the video tutorials and help book really gave me all I needed to create a decent presentation. I also appreciated the samples to see how others made it work. I realized that our kids are used to this--sitting down and having the tools they need to teach themselves something new. So much different from those first "computer workshops" we had years ago where we would all sit and wait for instructions to "do" the next thing. I played with Prezi for 8 hours that Monday. I had a day to myself and had planned on doing things around the house. But, I sat down at around 8 am and didn't break away from Prezi until around 4 pm. I was having a blast. (Anyone who read my posts on Twitter that day followed my short-term obsession with this great new tool!) I loved having the time to play and could have gone longer had I had more time. When I made the decision to jump in and create a Prezi for the district leadership academy, I knew I was putting a bit of pressure on myself. I had a PowerPoint ready but instead of making that one work and changing the pieces, I decided to start from scratch. As crazy as that sounded, I gave myself a pretty short term deadline--a time that I actually had to have a presentation ready to go. I was happy with the presentation that I shared, but there were definitely several things that weren't quite right--things I had to let go because I couldn't figure out how to fix them. I had to be okay with that. Do we give kids the time they need to "play" with something new before we expect something? Do they have the luxury of playing for long periods of time? Do we offer students lots of choices based on the way they think and create? Prezi offers a different process than other options and I want to make sure I have options for my kids and am not always assigning the tool that kids need to use. Do I avoid using tools with my students that I don't know COMPLETELY? If I had waited until I knew everything there was to know about Prezi, I would not have used it for a workshop until 2010. Do we allow our kids to use the tool before they can create something perfect? Do I give kids pretty doable work with short deadlines? Or do I drag these projects out forever? I could have worked on this for weeks--probably will go back to it and revise it over and over again. But I learned the basics, shared my info and created something that worked in just a week. What does that mean for our kids? In the spirit of the book Franki reviewed yesterday, LOVE YOUR WORLD, I thought I'd share OK GO. There are exactly seven words in this book up until the point when you open the double gatefold final spread: go, uh oh, stop, screech, I know. These seven words and the illustrations that accompany them encapsulate the entire history of consumerism, spending, and the use of natural resources in industrially and economically developed countries. Go: go faster, go more (use more, waste more, pollute more). Uh Oh: some nations are to this point, others not so much. STOP (and screech): what we need to do, either collectively or individually if we're going to save our planet. We need to send Carin Berger to Capitol Hill and let her read her book to Congress. She doesn't shy away from big problems, she proposes a myriad of solutions, and she practices what she preaches: all of the collage illustrations in her book were made with recycled materials. Better yet, let's read this book to our children. I'm pretty sure the optimism at the end of the book was meant for them. Here's Carol's review, and here's 7-Imp's illustrator feature. 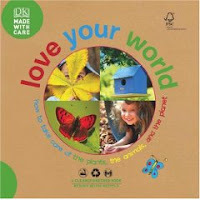 I picked up a copy of LOVE YOUR WORLD: HOW TO TAKE CARE OF THE PLANTS, THE ANIMALS, AND THE PLANET, published by Dorling Kinderseley. I have seen another book in this series--EARTH MATTERS--but had not realized that there was a series of these CLEANER GREENER books. This is a great little book for younger children. It is a nice size-about 8 inches square and it features great photos of young children doing the right thing for our Earth. The thing that makes this book stand out to me is that it talks to the child--the writing brings the child into the mission of the book. The book begins with the words, "Let's love our world and try each day, To do all things the GREENER WAY!". The rest of the book focuses on things to do like "We could put a bird house or a bird feeder in the garden." on the page that reminds kids that we can make our planet a good place for all kinds of life. This seems like a great book for young children---the combination of photos with very specific things kids can do works well. At the end of the book is a promise--listing the things we can do to love our world. The kids in the photos throughout the book look to be preschool age. But even though the kids are young, there are photos of so many other things dealing with the earth that I think older kids would be drawn to it too. So I am thinking this book makes sense Preschool through grades 3ish. I really don't even have to open a book that I notice is written by Lauren Child before I buy it. I automatically know that I will love it. No question. She is brilliant and I have loved every book she has written. So, I was thrilled when I saw Child's new version of GOLDILOCKS AND THE THREE BEARS at Cover to Cover yesterday. This time, Lauren Child worked with photographer Polly Borland and set creator Emily L. Jenkins to create an amazing version of this favorite story. "Her mother often worried about letting Goldilocks out of her sight, but sometimes the little girl would ask just one too many questions and stick her fingers in one too many pots of honey and peek under the lid of one too many saucepans. And her mother, unable to bear it any longer, would send her out to collect firewood." I think I love this book for lots of reasons. I love new versions of Goldilocks and have written about them before. I love Lauren Child--her writing and her creativity. And this book makes me think about my good friend's dollhouse when we were younger. She had a great dollhouse that you didn't really play with--instead we designed and redesigned it. Because of the sets, there is an element of play in this book as we see the home of the three bears as a little house. 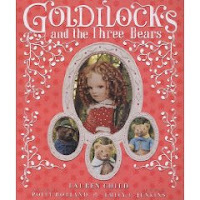 Now, this is my new favorite Goldilocks version-no doubt! So, I have spent the summer thinking hard about my goals for the coming year. What is my big goal in terms of the school library. What is my vision? 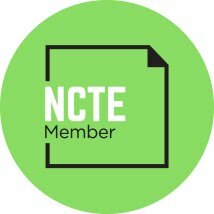 What can the library be for students and teachers? How do we get there? I have been lucky to find and benefit of so many experts in the field. I thought I'd share my learning and thinking. There are really no answers here, just pieces of inspiration I've found as I've been thinking through this coming school year in the library. "What is clear is that a lot of smart people--people who are out there teaching, speaking, moving, and shaking--are disappointed in what they see when they see school librarians. Either we have a perception problem or we need to do some serious retooling. I'd say we have to deal with both. In a hurry." This is definitely where my thinking is lately--how do rethink what the library can be--what is possible. Not an easy thing to figure out because I want so much in terms of possibility. "Through collaboration with the library and the use of a wide range of information sources and learning tools, together we could create this kind of learning experience via research in which students would not want to stop and would want to learn." Another post that got me thinking this summer was from Kim Cofino. The new library they've created is GORGEOUS. Who wouldn't want to spend as much time as possible in there. GREAT LIBRARIES! I love the idea of a Kinko's For Kids as suggested by David Warlick in his post last May. He says, "If the library might come to be seen more as a workshop where information isn't so much a product, as it is raw material (a Kinko's for Kids, if you will), then it may remain not only viable, but an essential institution." Personally, I LOVE Kinko's. I try to find reasons to buy some of the little tools that are sold there. I love the counter with the paperclips, paper cutter, etc. So many possibilities for what to create. Kinko's is all about making great "stuff". Through Kim, I found The Allen Centre. This amazing library and the people who run it have been kind enough to email me about the things they do. When I first saw the pictures, it was like someone had already created the library I had been dreaming of. So many ways for kids to find things to be interested in. How could a child not go into the Allen Centre without a sense of wonder and inquiry. The place invites questions and learning and finding the things you are passionate about. I love the link to the displays--it is one of my favorites on this particular wiki. So many engaged children around such interesting topics. Such smart invitations into learning. I was also excited when I saw the Dino-lite that is part of the Allen Centre. I immediately purchased one for our library. I am amazed at the images produced by this not-so-expensive digital microscope. This space helps me to see the possibilities for inviting kids to find the things they love to learn about. What better purpose for a library? I loved this recent post about the Allen Centre--so many things going on at lunch. Kids in charge of their own learning in so many different ways. Like many other school librarians, I am trying to work through the balance of books and technology. So many of us that I talk to are trying to figure out this balance--which is more important--books or technology? For me, I am not sure it is an either or. In my own life as a literate person, books are hugely important but so are my social networks, my tools, etc. They are all part of my days as a literate person. Darren Draper has a powerful little equation about libraries without technology on his blog. What happens when we, as media specialists, ignore technology? "In my opinion, the ideal school library is highly liberating and able to provide a learning environment that's not generally feasible, practical, or even possible in most traditional classrooms. While there always seem to be exceptions to every rule, I think that our libraries should be comfortable, collaborative, open, social, connective, modern, clean, up-to-the-minute, and with shooshing not generally required." I recently discovered a great blog Getting Boys to Read. There are several posts that have helped me think through the kind of environment that would make kids, especially boys, WANT to come to the library. He even has a great post dedicated to the topic of GETTING BOYS INTO THE LIBRARY. And then there is the question of gaming. What role should games play in a school library? I have been reading lots on the topic-catching up on the ALA documents, research, etc. I have been picking up games over the summer and plan to participate in National Gaming Day sponsored by ALA. I have lots of reading to do on this topic, but I definitely see the value in this. And Wesley Fryer recently talked about an Internet Cafe that focuses on gaming in his town--a great place for young people. How do we create communities like this in our libraries? I also watched this video on Today's Library. Some great thoughts by some brilliant people in the field. So, pretty much I want it all....I want to create a space that has something for everyone. A space where students, teachers, parents and community members love to hang out. I want it to be a place where kids own their own learning and find that they are dying to learn about. These posts are the posts that are helping me think about how that will actually look when the library is up and running. We have a laptop that is a few years old that we are hoping to set-up for our 9-year old. She has been using her iPod Touch but is doing lots of game playing and shopping . We want to make sure she has lots of opportunities to create. Ana is a creator at heart. She loves art and is often making things. She is a very visual learner and can learn something by looking at photos. Although she loves the Disney Channel and the usual shows, she also loves HGTV and the Cooking Channel. A few weeks ago, Ana decided to use an empty box to create a house for the 3 animals that she has accumulated from McDonald's over the summer. She started to gather lots of things from around the house, reminding us to save any empty toilet paper rolls, tissue boxes, etc. She was on the lookout for anything that she could use in her creation. I suggested that she take photos of her project, knowing that this might be a great time to teach her how to create something with the photos she takes. She has spent hours over the last two weeks working on the house. The TV alone took her days--she needed Sponge Bob to look "just-right". I love watching this kind of creation. She'd "work" for hours by herself, creating this house. I think this is why ages 9-12 are my favorite ages. No matter how sophisticated and grown up they are about some things, this kid factor is key to their learning. This to me, is the best kind of play.Always has been. Ana had just as much fun today, learning and working on putting her photos together. My husband taught her the basics of Garage Band and she worked for about 2-3 hours, choosing photos, deciding on the right music, recording her voice, etc. She is VERY excited about the final project and asked if we could teach her a new thing to do tomorrow. She knows there are lots of ways to "make things" and is dying to learn about all of them. My thinking is that after a few days of us showing her the possibilities, she will know lots about what she can create on her own--if we don't really worry about all of those final project things but really just let her get in there an play with the tools for a while. Imagine if we took the first few days in school to open up these possibilities for our kids. Here is Ana's first podcast! July. I'm nostalgic for it already. Life was slow in July. The first half I was still at home in Colorado. I came back to garden, travel, friends, projects around the house, and leisurely hours at Cover to Cover. Standing on the banks of July, it took nerves of steel to jump into the raging river of August which will carry me pell mell until a brief rest in mid-October for the Kidlitosphere Conference, a longer one in November for NCTE, and finally Christmas break, when I might actually be able to catch my breath again. We've swum a week into August. My head is still well above water and my breathing is steady. I know it won't last, but it feels good for now. I'm going to try to hold onto this feeling. Whether or not it's your birthday tomorrow, today brings the gift of poetry. Tricia has the round up at The Miss Rumphius Effect. "I journeyed for almost ten years before I found home. Adoptions are like very delicate gardening with transplants and grafts. Some are rejected immediately. Mine took hold, rooted, and bloomed, even though there were inevitable adjustments to the new soil and climate. Yet I have not forgotten where my roots started." Ashley shares her life experiences in a way that is honest and sincere. Her resiliency and brilliance about people comes through on every page. I kept having to remind myself that this was a true story--it was often hard to believe how much this child went through. For a while, things never seemed like they would work out. Since I have a huge interest in adoptions and children's rights, I probably read this book differently from readers who might just pick it up for a good story. It is listed as a YA novel which makes sense. I think it would be a great read for high school students. But I hope that it doesn't get missed by adults--it is a great story of family and love and home. A true story of a girl who is has already made a huge difference in the world. Ashley tells us about so many of the people who made a difference in her life. Although there were lots of horror stories--awful foster homes, incompetent social workers, etc. there were also many people who cared deeply for Ashley and worked to support her. Ashley Rhodes-Courter is a national speaker and is committed to changing the systems that take care of children in foster care. She seems ready to dedicate her life to this cause--to make sure that children have the love and safety that they deserve. I will definitely be recommending this book to all of my friends who are adoptive parents. I will hold it for my own daughter to read when she is a bit older. This will most likely be the book that I will talk about to anyone who will listen for the next few months. One of those books that I want to put in as many hands as possible. And you can be sure that if Ashley is in the area speaking anytime soon, I'll want to thank her personally for sharing her story. Carmen Agra Deedy's website here. 14 Cows for America tells a powerful story of ubuntu, or empathy for other humans. In this story, a young man who witnesses an attack on strangers gives his most valuable possession to help them heal. The story is amazing, but it is the pictures that draw me back into the book over and over again: the sky, the light, the variety of points of view, the realism, the color, and the cinematic flow. I had the good fortune to be able to talk to the illustrator, Thomas Gonzalez, about his vision for the story. Amazingly, this is Tom's debut in children's book illustration. However, the path of his life seems to have led him directly here. When he was a child in Cuba and then in the United States, drawing was like a second or third language for Tom, and his ability to bring the world to life on paper amazed his childhood friends. Tom graduated from The Atlanta College of Art and has worked for 20 years in advertising and design and as an art director. 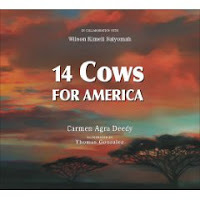 But when he reconnected with his one of his childhood friends who had also come with her family from Cuba to the U.S., Carmen Agra Deedy, and when he saw the manuscript for 14 Cows for America, he knew instantly that he wanted to illustrate this book. It took some convincing, but luckily Peachtree took a chance on him. Tom brings to this book his admiration for Maxfield Parrish's realism and for the precise techniques of Japanese airbrush illustrators. He brings his strong sense of design -- for the scale and placement of objects -- and lots of background research. He began each spread with a pencil sketch of stick figures and sky. He then used pastels to block out the pictures, paying close attention to shading and to the light sources to give a sense of realism (here's the Parrish influence). Next he used acrylics and he tightened his lines with brushes and pencils to enhance the details. Finally, he used airbrush to retouch the pictures in spots. My favorite part of the book, in terms of the illustrations, is when the American diplomat comes to Kimeli's village. On the left side of the first two-page spread, we see the diplomat's Land Rover in almost complete darkness driving towards the village. The sky looks like there is an approaching or retreating storm, or else it is the last light of dusk or the first light of dawn. On the right side, there is light breaking through the clouds and illuminating the village. The text reads, in part, "As the jeep nears the edge of the village the man sits up. Clearly, this is no ordinary diplomatic visit. This is..." Then you turn the page and --BAM!-- you are suddenly in the midst of color, dance, and movement -- the exuberant village welcoming the visitor, not for a diplomatic visit, but for..."a ceremony." When I talked to Tom about what these pages said to me, about the American people, represented by the diplomat, in their time of darkness, and the Maasai people lit by their desire to respond to suffering and injustice with their kindness, he was pleased that I found meaning that was not his intention. And then he asked me to go back and look for the symbolism that he did intend. In almost every illustration, Tom has included a twin tower image -- it may be a pair of figures, or spears, or giraffes, or uprights from the cows' pen, or the two shafts of light beaming down on the village, but almost every picture in the book bears the reminder of the act of violence that prompted the ubuntu, the selfless act of caring and sympathy of the Maasai people to the American people. As we talked about how this story affected him personally, Tom said that for him this story is about far more than just 9/11. This story says that no matter how powerful you are, unexpected circumstances can come out of nowhere and totally change everything...and that help often comes from people you don't know. For Tom, this book is about the connectedness of all people. Children's literature is lucky that Thomas Gonzalez found this new path in his career. He has several more children's books in the works. Keep an eye on his website for news about these upcoming projects.